Homemade pizza is a labor of love and IMHO well worth the effort. Once I overcame the learning curve, I found making pizza is something I look forward to each week. I get into my zen zone and the process unfolds. It’s not hard to do…. it just takes a little pre planning, practice and time. 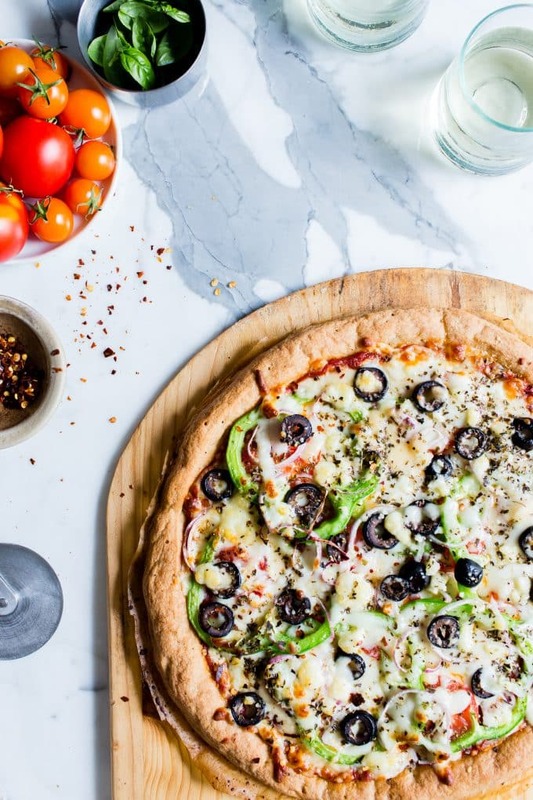 This gluten free Greek Pizza isn’t the authentic crust variety, rather it’s the toppings that give this vegetarian pizza its name. 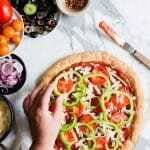 This gluten free pizza recipe is layered with Homemade Pizza Sauce, Mozzarella, tomatoes, onions, bell peppers, more cheese, olives and feta cheese to create a mediterranean pizza. Start with a par-baked Gluten Free Pizza Crust (glutenous dough can be used as well – see recipe notes). Preheat the oven a pizza stone or sheet pan to 550F. Slather on Homemade Pizza Sauce. Layer on tomatoes, bell peppers, onions, olives, more cheese and finally the feta. Bake for about 7-9 minutes! Homemade Gluten Free Pizza Crust, as seen here, can be used in this recipe or a glutenous pizza dough. 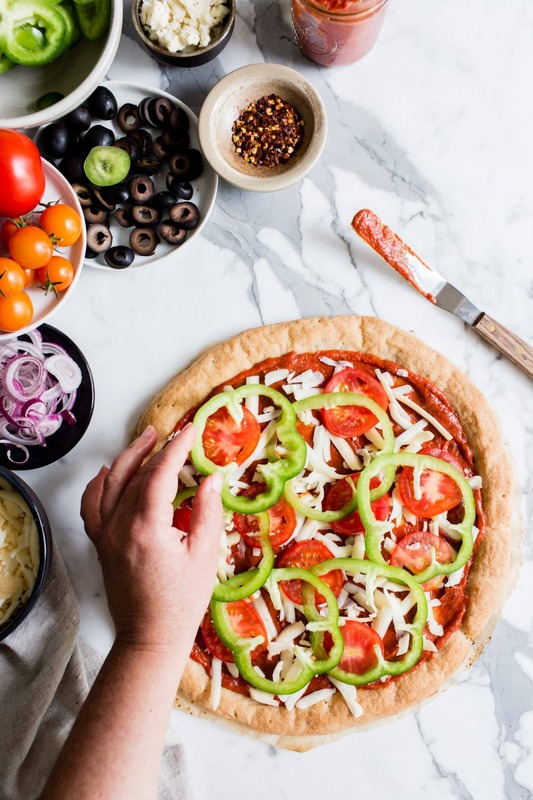 Homemade Gluten Free Pizza Crust is par-baked before the toppings are added where as a glutenous crust is baked raw with the raw toppings. See notes*** for more information. Use Homemade Pizza Sauce for this and any pizza recipe. Five minutes is all you need, and it’s freezer friendly! Share this Greek Pizza with delicious Pickled Banana Peppers. 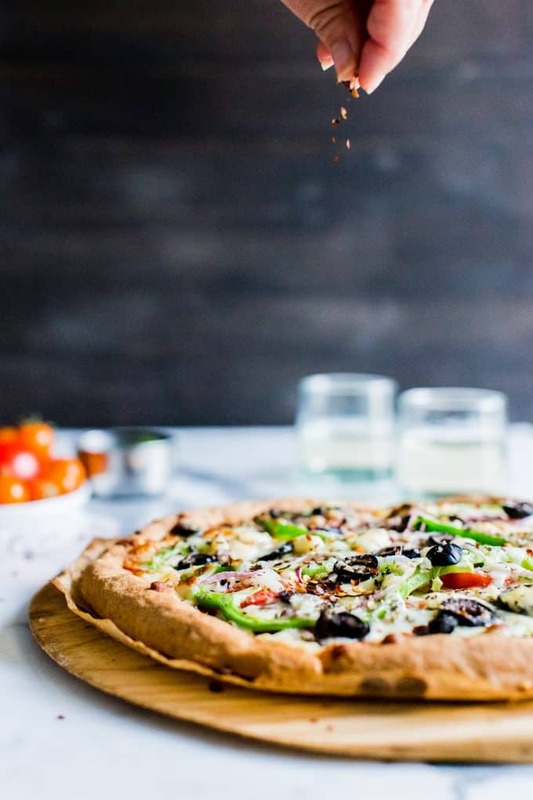 I love both black and Kalamata olives and use them interchangeably in this mediterranean pizza. Use what you love! Kalamatas are saltier and have a sharper taste than black olives. If using Kalamata, consider scaling back a bit on the feta as it’s salty as well. Freezer Friendly? Unfortunately not. But this gluten free pizza makes excellent leftovers. Simply store the leftovers in a lidded container in the refrigerator for up to three days. Get the Oven Ready: Prepare the oven by placing oven rack at the very top setting and if making two pizzas, another rack directly below the top. Place sheet pan(s) and/or pizza stones on racks. Two pizzas can be baked at the same time. Preheat the oven to 550F (288C). Make the Pizza: Place a piece of parchment paper on a cool sheet pan. Place the par-baked gluten free pizza crust on top of the parchment - no need for parchment if using a pizza peel.***. Slather on the pizza sauce. 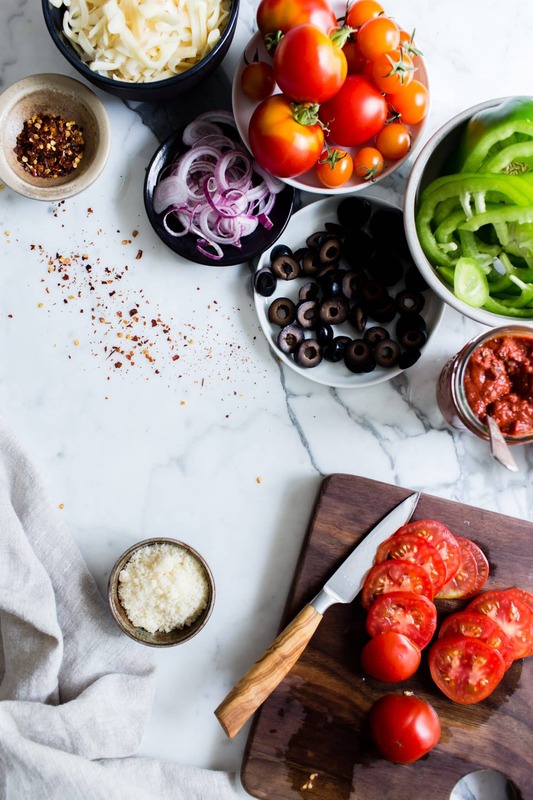 Add a thin layer of mixed cheese or mozzarella, then evenly distribute the tomatoes, bell peppers, purple onions, olives, remaining cheese, and feta. Sprinkle on the Parmesan cheese and oregano. Bake the Pizza: Using a pizza peel or the back of a sheet pan, slide the pizza on to the preheated stone or sheet pan. 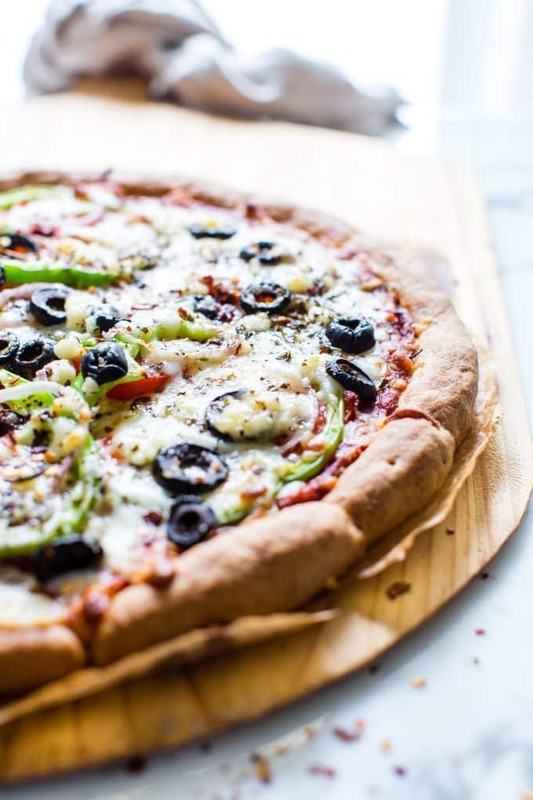 Bake the assembled pizza on a preheated stone or pan at 550F (288C) for 7-9 minutes or until the cheese has melted and sauce is bubbly - a little cheese blistering is okay! The pizza bakes fast at high heat, so keep an eye on it! Remove from oven, sprinkle on the fresh basil and allow to rest for five minutes. Cut into 8 equal pieces. *If using glutenous pizza dough, the same bake method will work with raw dough. No need to par-bake the dough. (I used this method in my pre-gluten free days***). **If using a cheese mix with Parmesan cheese, look for cheese made with enzymes instead of rennet (not vegetarian friendly). Also for veg friendly Parmesan cheese check out BelGioioso and Organic Valley. I found this comprehensive list that shows brands who produce vegetarian friendly parmesan cheese. For more information, check directly with your preferred cheese maker. ***Parchment is helpful in transferring the par-baked gluten free pizza to the oven if not using a pizza peel because you can use the parchment as a handle to slide the pizza from a cool sheet pan to the preheated sheet pan/stone. If using a peel, the par-baked pizza will slide right off. 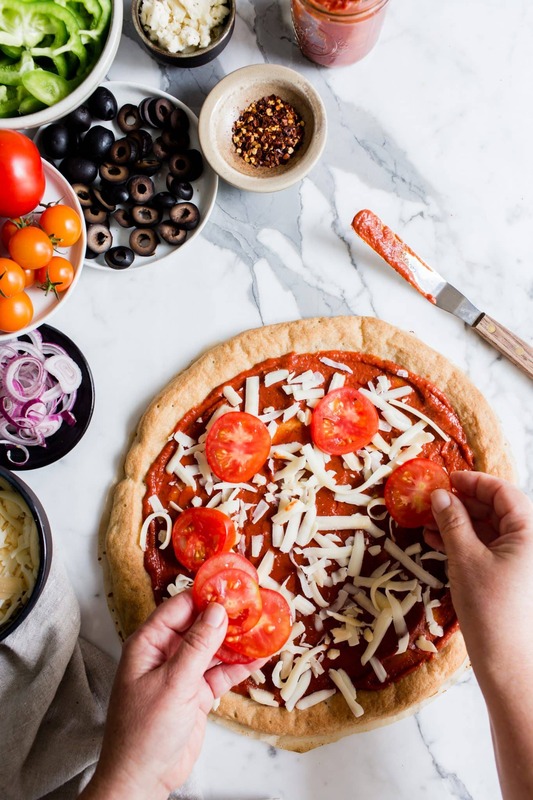 If baking a regular/glutenous pizza, you'll need the parchment under the pizza dough to bake it as regular shaped dough is not par-baked in this recipe. Mouth Watering !! Very nicely done but I think the key here is to make sure you buy really quality ingredients. Thank you Laura! Quality ingredients are key to good cooking! Agreed! A pizza night is just what I need! 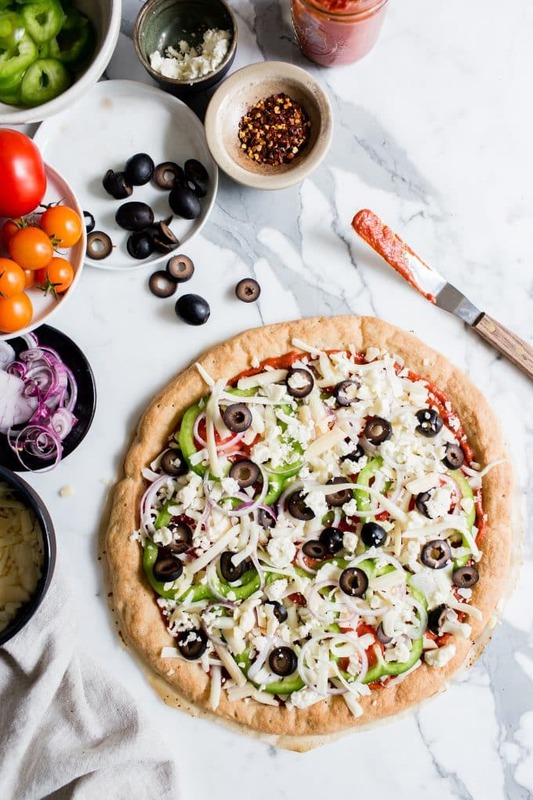 Love the Greek-inspired topping! I LOVE greek pizza, Traci! When I visit my mom, she has a great pizza place near by and we always get the greek pizza. Feta is so good on pizza (and on everything else in my books). I need to try this at home – and your photos are gorgeous! Pinning to share! Hope you’re having a great weekend! A great post, and such beautiful photos. I don’t need to be GF, thankfully, but I love your pizza recipe! I like lots of sauce and cheese! Thank you Mimi! All the components work together to create something truly special. Traci, I truly appreciate your work ! Thank you for your kind note and support! Homemade pizza is definitely worth it! These flavors sound fabulous! Reminds me of a trip this Summer. I can’t wait to try it out, Traci! Agreed, Liz! Ohhh yessss… your trip to Greece! Totally dreamy! Absolutely love the Greek inspired toppings for this pie Traci! And I’m totally up for the homemade pizza sauce! Such a great Friday night meal. Perhaps a little Netflix bingeing and some pizza! Sounds like a delicious plan! Right? 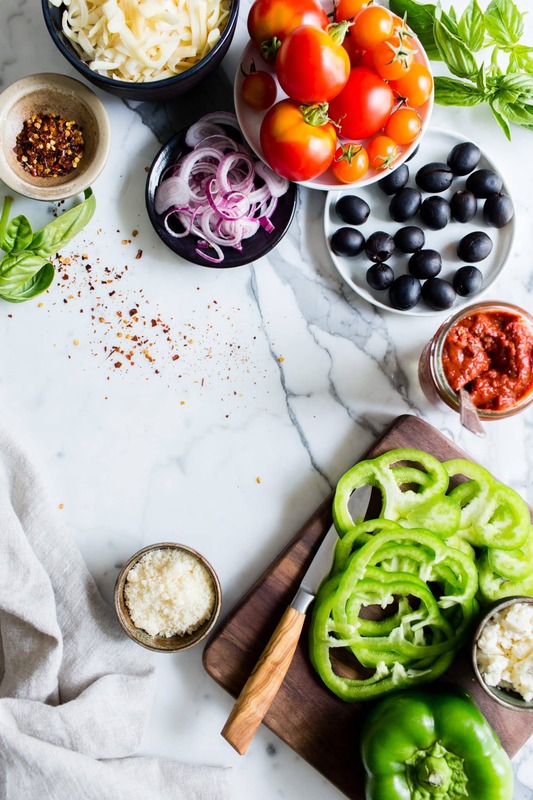 It makes all the difference in homemade pizza – a good sauce sets the stage for those scrumptious toppings. I like the idea of a bit of Netflex and pizza (the perfect weekend night IMO)!